To understand John’s journey, we need to give you a snapshot of his achievements. He is a Commissioned Information Professional Officer in the U.S. Naval Reserve, and has over 20 years of experience in information technology, emergency management, and communications. He worked for the city of Philadelphia for 15 years, holding several positions relating to local emergency response activities. This includes time as the Deputy Director for the Managing Director’s Office of Emergency Management, where he was in charge of IT and emergency communications. He then moved into a role as FEMA Regional Emergency Communications Coordinator for Region III, where he was the project manager for the Disaster Emergency Communications program. And most recently, he was the Regional Communications Coordinator with the National Protection Programs Directorate, Office of Cyber Security & Emergency Communications. Despite his real world experience, military training, professional certifications, and other credentials that qualified him to continue progressing in his career, John found himself stuck. He recalls that his career seemed to reach a ceiling because he didn’t have his bachelor’s degree. When John heard about Veterans Upward Bound (VUB), a pre-college program federally funded with a grant from the U.S. Department of Education, Office of Postsecondary Education, he recognized the opportunity to change his future. One of eight federally funded TRIO Programs, VUB offers support services for veterans to complete their education. After enrolling in Veterans Upward Bound at the University of Pennsylvania, John found his way to Peirce in 2005. He recalls the flexible, supportive, and accelerated environment that made returning to school in his late 30s less overwhelming. It was important to him to attend an accredited institution where he could continue to meet the demands of his job in emergency management while earning a degree. At Peirce, he was able to take courses online, at night, or on campus, depending on where and when his 24/7 job as an emergency responder demanded he be. John also received academic credit for his relevant military experience and IT certifications, which started him off on the right foot. The career-focused degree programs allowed John to focus on information technology while surrounded by like-minded adult learners. John says that the tutoring program and the Walker Center for Academic Excellence gave him the academic edge he needed, while Peirce also connected him with the tools to finance his education. Being a military-friendly school, Peirce offers a Protect & Serve™ Grant which saved John 25 percent on his tuition. He was also awarded Peirce’s Information Technology Scholarship in 2007. In June 2008, John reached a life-long goal. He graduated with his bachelor’s degree in Information Technology and a concentration in Network Administration. But he didn’t leave Peirce behind as he went from student to alumnus. He says that his time at Peirce College was an awakening for him and one that he carries forward in all that he does. 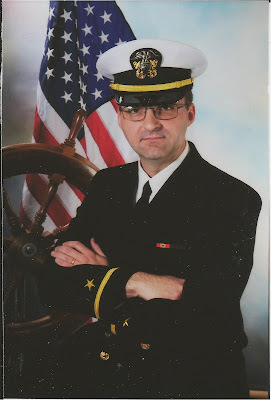 With his newly minted degree, John became a Naval Officer in 2008. About a month after graduation, the Navy approached him about applying for a Direct Commission as an Information Professional Officer. Many applied that year but only a handful were selected. John was one of them. Earning his degree wasn’t easy. John recalls living moment to moment during those years, facing the challenges of balancing work, school, and family. Every in-class exam came with the fear that his beeper would go off and he’d be called out to a fire. His time for schoolwork was mostly between 10 p.m. and 2 a.m., and there were plenty of nights when he’d finish up at 2 a.m., then be called out at 3 a.m. I couldn’t say it better than John – he called it a wild ride. But the sacrifices weren’t without a great payout. John has had many more opportunities to serve the public at large in new capacities while also preparing better for his family’s future. John, his wife, and their three daughters are now settling in Maryville, Tenn. Here, he is focusing on family and his role as Regional Coordinator for Region IV, while simultaneously pursuing his master’s degree in Homeland Defense and Security Studies. And in his (extremely limited) spare time, John has been working on his thesis about deconflicting emergency communications during disasters. Congratulations, John, on being named one of the 2011 National TRIO achievers and this year’s PA TRIO Achiever! We’ll be thinking of you on Sept. 27 when you and the other award recipients are honored at the Council for Opportunity in Education Annual Educational Opportunity Dinner in Washington, D.C. These are well deserved honors, and we are very proud to call you a member of the Peirce community.